My friend Emily once told me that there’s something to be said for subservience in a relationship. My automatic reaction was to dismiss her. I’ve been raised to resist dependence, particularly on a boyfriend, and the idea of being subservient seemed, well, rather archaic. But I keep coming back to this, the skill (yes, it’s a skill) that allows you to concede absolute control to someone else. I just can’t seem to do it – I can’t release my grip on the reins, even when I’m passing them over to someone I trust completely. It’s taken me a while to come around to the idea that this is not always a redeeming quality. Sure, it’s great to be independent, but at some point, I’m going to have to let go. This little problem of mine has been a constant handicap. For starters, the thought of going in a cab paralyzes me for the simple fact that I am nowhere near in control. Sadly enough, this also happens to apply to when my boyfriend, TJ, is driving. My backseat driving is only the half of it. I get so bad that if TJ even tries to do something spontaneous (and dare I say, romantic), I panic. If I haven’t planned, mapped and predicted the day’s events, I can become a bit hysterical. Which, I’m realizing, is not only affecting my own sanity and quality of life – it’s paying a pretty heavy toll on TJ, too. He can feel powerless, like he’s constantly sitting in the passenger’s seat of our relationship as I drive along as planned. Needless to say, this has caused issues. So as much as it pains me (and that women’s studies degree I have lurking in my back closet), I am finally conceding that yes Emily, there is a lot to be said on mutual subservience in a relationship. And there certainly is a lot to be said on not just having trust, but actually showing it. In a large bowl, sift flour. With a pastry blender, cut in butter and shortening until mixture resembles pea-sized pellets. In a small bowl, combine water, salt and sugar until granules dissolve. Make a well in center of flour mixture and add water mixture all at once. With a fork, stir mixture until water is completely absorbed. Gather into a ball, wrap in plastic wrap and refrigerate for 20 minutes. Mist a muffin or tart tin with cooking spray. On a flour-dusted board, roll out dough into 1/8 to 1/4-inch thickness. 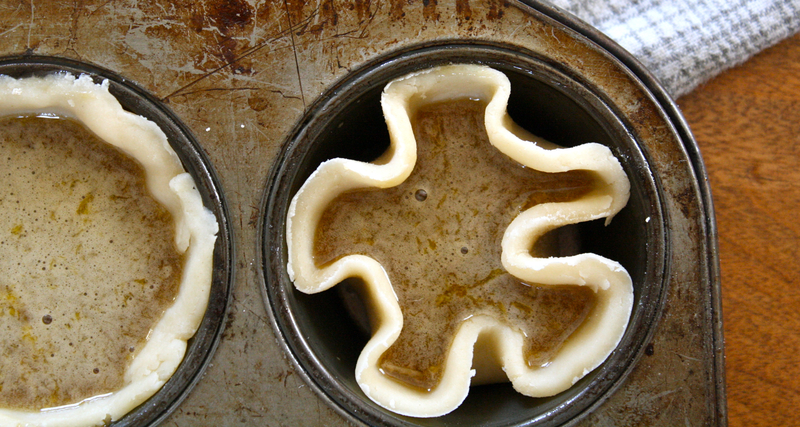 With a floured round cookie cutter or the rim of a glass (circle should be large enough for pastry to fit in tin cups), cut dough into circles and line tin with pastry; if desired, cup tart shells in the palm of a rounded hand to form into a flower shape before placing in tin. Set aside. In a medium saucepan, melt butter on medium-low. Add sugars, corn syrup, vinegar and vanilla. Bring to a simmer and cook, stirring constantly to prevent mixture from burning, until thickened. Remove from heat and whisk in eggs, one at a time. 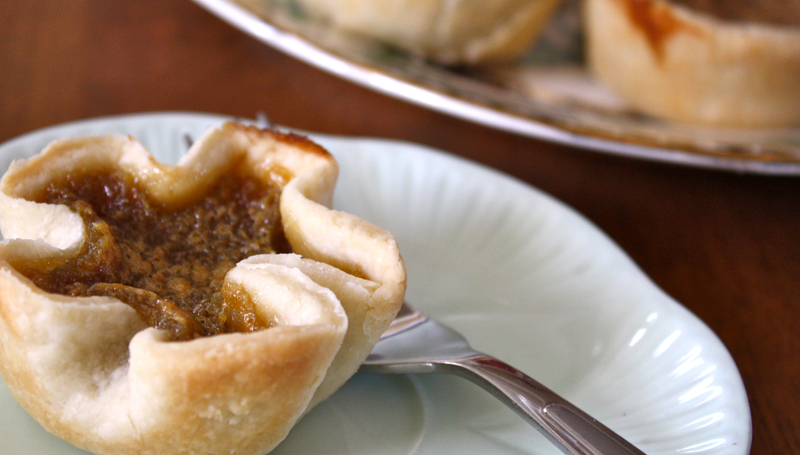 Divide mixture among tart shells, filling each 3/4-full. Bake until golden brown, 12 to 15 minutes.